If you wish to plan a proper lavishness jungle experience, a luxury relaxed hotel option is The Oberoi Vanyavilas. This luxury resort is located neighboring the edge of Ranthambore National park at Sawai Madhopur district in Rajasthan region in north-west India. The Oberoi Vanyavilas is most important luxury jungle resort in India. You can choose your nesting in the lap of nature with charming hills. The luxury resort Vanyavilas is place over twenty acres of land, which has more than fifteen hundred trees, which includes Indian goose berry , lemon, orchards of mango and guava. The resort offers an admirable Swiss luxury tented accommodation and provide surpassing services to the guests. There are walkways all over the resort with viaduct. There is long water-way with colorful fish and lotuses. The watching tower in house the resort provides a stunning outlook of the whole area. 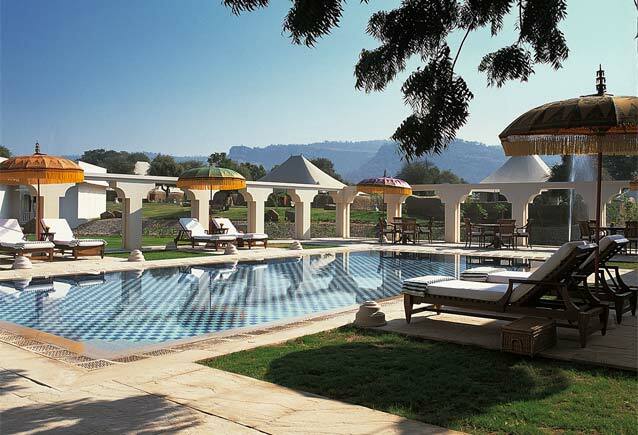 The Oberoi Vanyavilas resort goal to offer a greatly bespoke service. Team members of resort do their supreme to meet guests necessitate and demand. This is the first luxury jungle resort in India and structure of 25 luxury air conditioned Swiss tents with their individual secretive walled backyard situated tactfully so as to make sure utmost retreat. The luxury tents are teeming with all contemporary high end facilities, views of the close by hills. The interiors of the tents are wonderfully adorned with delicately embroidered canopies. All tents have teak wooden floors. Each Luxury Tent has private sitting area, king size four-poster beds, separate roll-top baths and showers, electronic safe, personal bar and satellite television. There is also an outside deck as sunbathing area are in ideal distinguish to the ruggedness of the jungle. Above per night rates are on room only basis & subject to tax.